Hendrik Lesterhuis and Danny Andrade, two friends from the Unites States, are about to embark on the adventure of a lifetime! They are travelling to Tanzania to climb the tallest freestanding mountain in the world and one the Seven Summits – Mount Kilimanjaro. These two climbers will traverse this great mountain via the Umbwe Northern Circuit. They will make their attempt on the mountain crossing some of the more remote and quiet trails while enjoying the beautiful and unspoiled sections of Kibo’s northern flanks. After their climb Danny and Hendrik will join Berg Adventures Safari guides on a six day wildlife Safari. They will travel to Tarangire, Ngorongoro and Serengeti to view the spectacular wildlife that northern Tanzania has to offer. Follow our daily dispatches as these two friends make their attempt on this great mountain and celebrate their ascent with a luxury wildlife viewing! February 19, 2014 – We Made it to the Summit of Kilimanjaro! February 17, 2014 – In Position for the Summit! February 13, 2014 – Setting Goals and Making Them Happen! 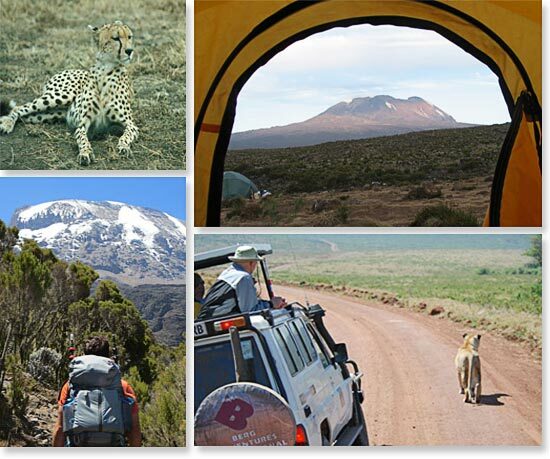 February 12, 2014 – Danny and Hendrik are Doing Great at Barranco Camp! February 10, 2014 – Danny and Hendrik Arrive in Arusha!